The Northern Lights May Be Visible Over the U.S. Tonight. Here's How to See It. It will not visible across the entire country, but parts of the northern US may have the opportunity to see the northern lights on the nights of both Wednesday, January 30 and Thursday, January 31. 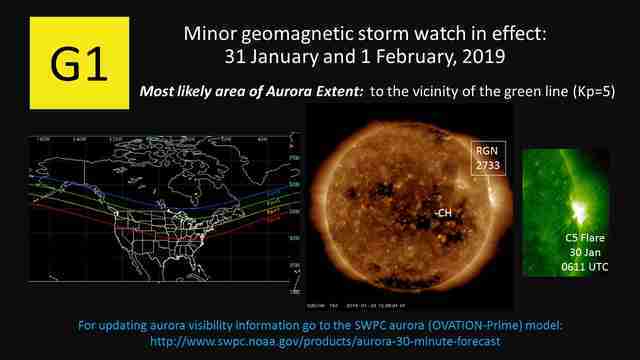 The Space Weather Prediction Center (SWPC) has issued a G1 (minor) geomagnetic storm alert for both nights, which is a good sign for aurora hunters. Thursday evening, the SWPC upgraded the second day to a G2 (moderate) alert. The aurora borealis could make an appearance due to a coronal hole high-speed stream detected by the SWPC. If you're just looking to cross the stunning spectacle off your bucket list, ignore that part. All you need to know is that if the conditions are right in your neck of the woods, your moment may have arrived. The SWPC posted the above image to show the areas where the aurora might be seen. On the map at the left of the picture, the green line indicates the southernmost reach of the display. If you aren't fighting cloud cover and are brave enough to venture out in the midst of an intense, record-breaking cold snap, you should be able to catch the aurora in parts of Alaska, Montana, North Dakota, Minnesota, Wisconsin, Michigan, and the northern tip of Maine on Wednesday night. The next night the alert encompasses all of those states plus Washington, Idaho, Wyoming, South Dakota, Iowa, Illinois, New York, Vermont, and New Hampshire, as well as tiny bits of northern Indiana, Ohio, and Pennsylvania. If you're in Canada, you should be able to spot it almost everywhere outside of Nova Scotia, New Brunswick, Newfoundland, and southern regions of Ontario, Quebec, and British Columbia on Wednesday. It'll be everywhere on Thursday. The video above shows the northern lights over northern Michigan's Mackinac Bridge in early 2018 following a G1 alert. That gives you a sense of what it might look like at the southern line of the map above. Under these circumstances, you aren't likely to have the brilliant overhead ribbons of bright light you'll find in, say, Iceland or other northern regions, but it's still absolutely worth seeing. The SWPC's 3-Day Forecast has the G1 alert two nights in a row. The first alert from 2-5am EST the morning of January 31. Thursday night, the G2 alert, when your chances are best, lasts from 8-11pm EST. During the second window, it will be too light for the aurora to be seen at its outset, but as it gets darker you should gain a better view, so maybe plan to head outside later rather than sooner. After 11pm, there is still a G1 alert on Thursday that will last until 2am. For a good view, you'll need to get far from the light pollution of suburban and urban centers. All of that light makes it difficult to see the stars, let alone the aurora. An SWPC representative previously told Thrillist, "You need very clear skies, a good view of the northern horizon (no trees, buildings, or hills), and it needs to be dark." 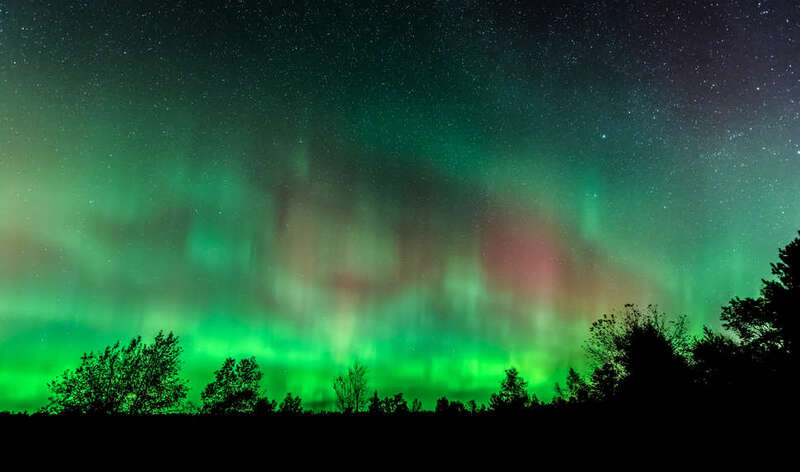 You'll need a view of the northern horizon because, unless you're somewhere like Alaska or Finland, the lights will only be seen along the northern horizon rather than directly overhead. It also helps to be outside for a while. Your eyes need time to adjust to the darkness to see as much as possible. Though, that's no small as considering the inhumane temperatures that have been sweeping across the northern parts of the nation. The northern lights absolutely creep down to the US from time to time, but it's not a common occurrence and can feel even less common when you factor in that the weather needs to cooperate and that you probably don't want to go out when it feels like -50 outside. Moreover, the solar cycle is near its minimum, making events like this occur with less frequency. That makes this a great opportunity to get outside, cross the northern lights off your bucket list, and rehearse a braggy speech you'll perform at work the next day.